Volunteering at the Wetlands and Wildlife Care Center can be fun and rewarding. The WWCC is always in need of volunteers. If you are interested in becoming a volunteer, please fill out the form below, or call us at (714) 374-5587. When the list of interested volunteers grows large enough to schedule a volunteer class, you will be contacted with the details. Click here to see when the next Volunteer Class is scheduled. We care for animals who will hopefully be returned to the wild. Their survival depends upon them not becoming imprinted on humans. There is a variety of work to be done at the center. Most of the work requires us to roll up our sleeves and get dirty. Typical work involves cleaning cages, washing dishes, doing endless laundry and cleaning more cages. There are also other volunteer opportunities such as: volunteering at events, stuffing envelopes, data entry, etc. A minimum of 4-5 consecutive hours per week is asked of each volunteer. In return, you may get to watch a sick or injured animal recover its health. 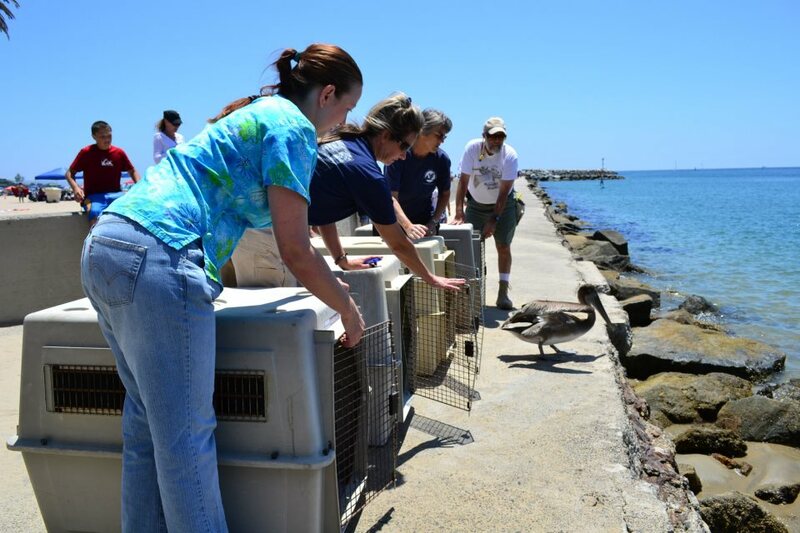 You may get to hold open the cage door as a rehabilitated bird is released into the wild. Or you may nurture an orphaned baby who may mature and raise its own family in the wild. The center teaches wildlife rehabilitation and animal husbandry. Volunteers may learn everything from the math of calculating calories for proper animal feeding to the biology of animal diseases and anatomy. Volunteers will also learn about the natural history of the animals native to Orange County and the geography of migration that brings animal visitors from as far away as Canada and Chile. Responsibility is emphasized in the program; our responsibility as citizens to care for the environment and the volunteers' individual responsibility to arrive on time, follow rules, ask questions and work hard. Volunteers will enjoy working in small groups with experienced staff while learning to handle and care for wild animals. Proper sanitation techniques and the reasons for them will also be taught. Time management, adaptability and working calmly under stress are all part of the daily environment at our busy, ever-changing facility. Must be 18+ years of age or have parental/guardian approval form completed if between the ages of 16 & 18.